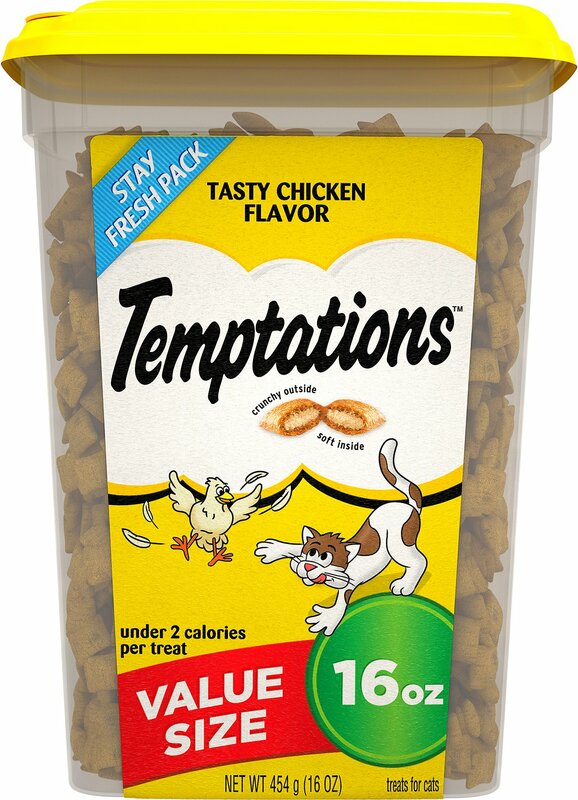 Tempt your kitty with the scrumptious taste and enticing texture of Temptations Tasty Chicken Flavor Cat Treats. These unique little pocket-shaped rewards have an irresistible crunchy outside and a soft and creamy inside with the savory taste of chicken. 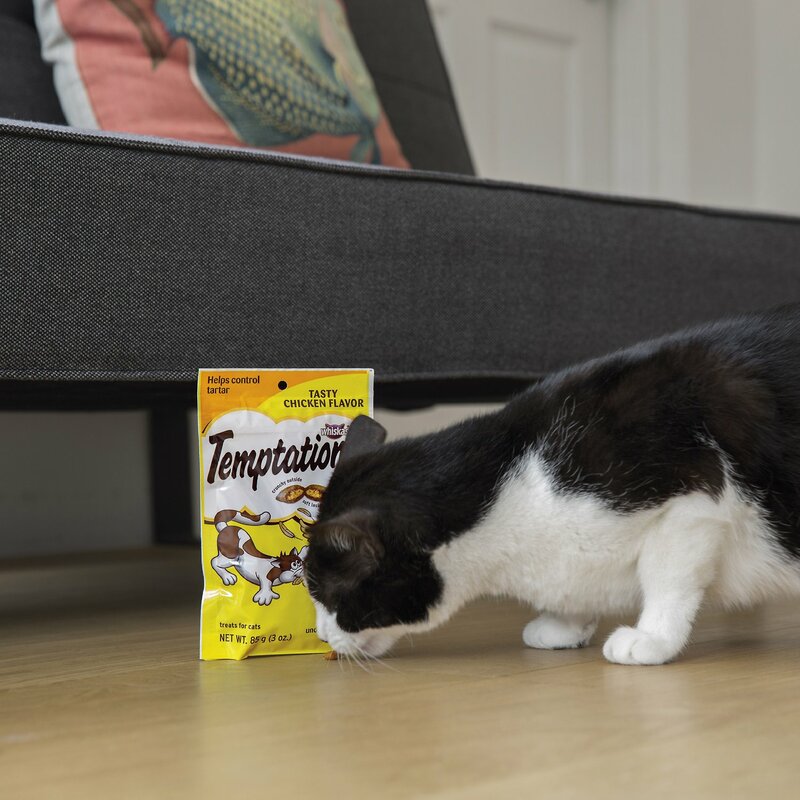 These Temptations treats are 100% nutritionally complete and balanced for adult cats and are just under 2 calories per piece. Shake the bag or tub to capture your cat’s attention and watch her run towards you with pure excitement, ready for her next reward! 100% nutritionally and complete rewards for adult cats. Each piece has under two calories per treat, so your cat can enjoy more, and you don’t have to feel guilty about giving her more! 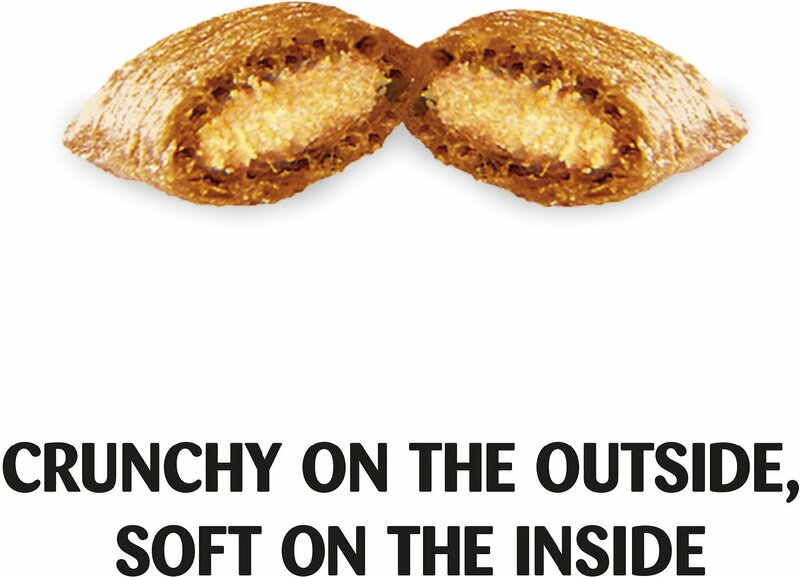 Delivers a variety of textures with a crunchy outside and a soft and creamy inside. 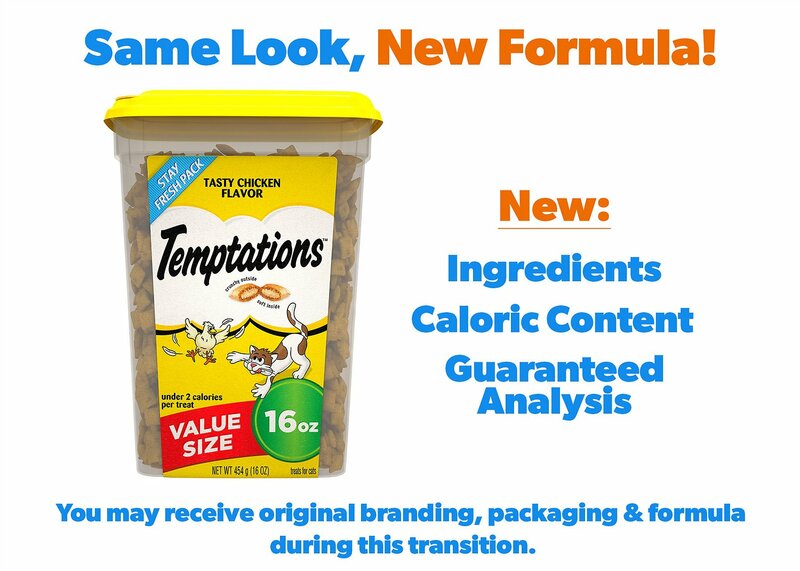 Made with a unique pocket shape and a lip-smacking chicken flavor that will have your pal purring for more. Crafted with vitamins and taurine—an amino acid that helps support your cat’s overall health and well-being. 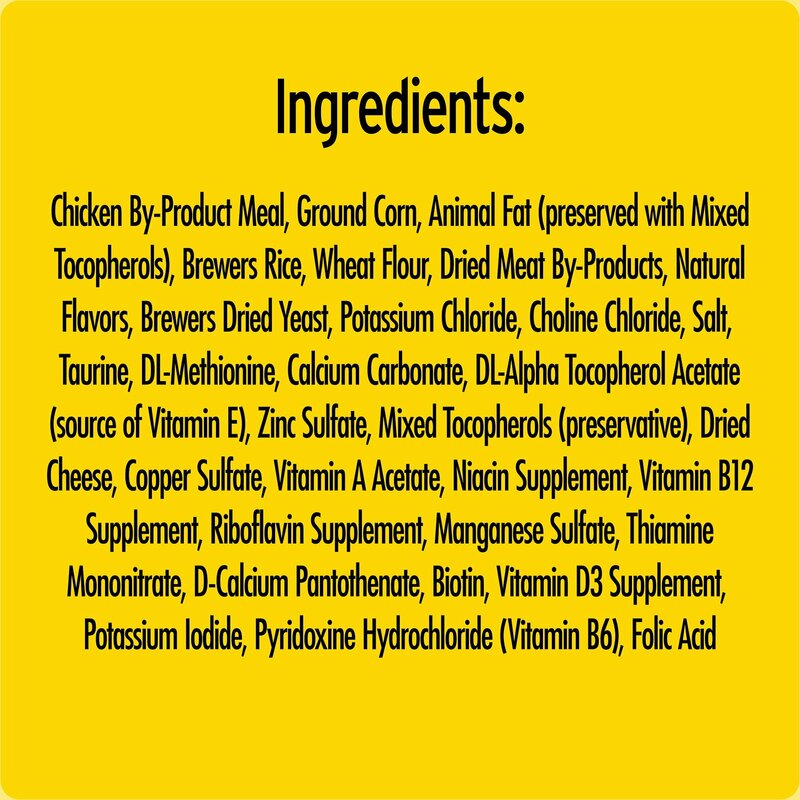 Chicken By-Product Meal, Ground Corn, Animal Fat (Preserved with Mixed Tocopherols), Dried Meat By-Products, Brewers Rice, Wheat Flour, Natural Flavors, Grain Distillers Dried Yeast, Potassium Chloride, Choline Chloride, Salt, Taurine, DL-Methionine, Calcium Carbonate, Vitamins (dl-Alpha Tocopherol Acetate [Source of Vitamin E], Vitamin A Acetate, Niacin Supplement, Vitamin B12 Supplement, Riboflavin Supplement, Thiamine Mononitrate, d-Calcium Pantothenate, Biotin, Vitamin D3 Supplement, Pyridoxine Hydrochloride [Vitamin B6], Folic Acid), Minerals (Zinc Sulfate, Copper Sulfate, Manganese Sulfate, Potassium Iodide), Mixed Tocopherols (Preservative), Dried Cheese. 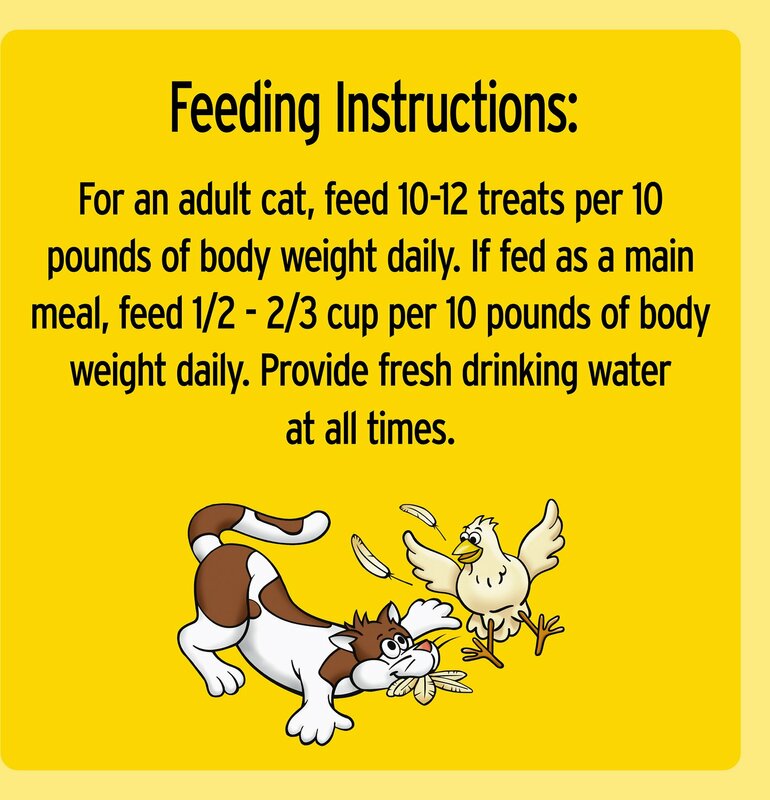 Feed 10-12 treats per 10 lbs of cat daily as a treat or snack. Provide fresh drinking water at all times. Cats come for these every single time -- just wish they were better for them. We've been isolated due to severe flooding so our small local grocery has been the only store available for months! They do not carry Temptations and the other brand was simply appalling to my two cats. They sulked in front of their bowls and were greatly unhappy. Thank you Chewy for your service to catkind! Our cats love the Temptations treats with catnip so I decided to try the Chicken Flavor to see if they would like it too. Not so much but they love their treats so they definitely don't turn it down! Will probably go back to the one with the catnip since that one is their favorite but would still recommend this one to other cat lovers. My 3 babies go crazy for their Temptations. They recognize the colour of the box (as well as the various packets) and know exactly which cupboard they are in. It's like a frenzy when I walk past that treats cupboard - they get so excited and jump on it. My furbabies just love their Temptations! We always laugh and ask ourselves what is in these treats because EVERY cat LOVES them! Inside cats, outside cats, feral cats, jeez lions would probably go for them. Our cats sit in front of the cupboard and meow for them. We haven’t been able to train anybody to do anything useful, like work or run the vacuum, but if we were smart enough to train cats these treats would be the reward to get the job done. My kitten loves the treats, but the container was smashed and the treats spread throughout the box. Of course the cat jumped in the box and munched to his hearts content. I believe the cases of Fancy Feast slid into the plastic treat container. Nigel the Cat does highly recommend the treats, though. I call them "cat crack"
We have 6 indoor cats and every evening around 7:00 PM my wife gives all the cats some of these treats! They come running from all over the house and do not want to miss out on this evening ritual! Your cat or cats would probably enjoy them also. My kitty penguin will only eat Temptation (any flavor). I have bought her treats from wellness, whole hearted, blue buffalo etc. but she will not eat them. She hears the bag of Temptation and she comes running. She absolutely loves them.